Note: opening Easter Sunday only. Less than four years old, Trevilyan Alba Hame (Scottish for White Home) is a good example of how, with careful design, good plant selection and thorough preparation of the site, a garden can grow and quickly acquire a look of maturity beyond its years. Mostly the layout of the garden is formal with hedges emphasising the design. In the front garden, massed carpet roses and purple lantana hedges create a vibrant display of colour with gaura planted to attract butterflies. A large area of lawn in the back garden is balanced with hedged beds of roses and perennials. Arches are planted with climbers just beginning to grow up and over the structures. 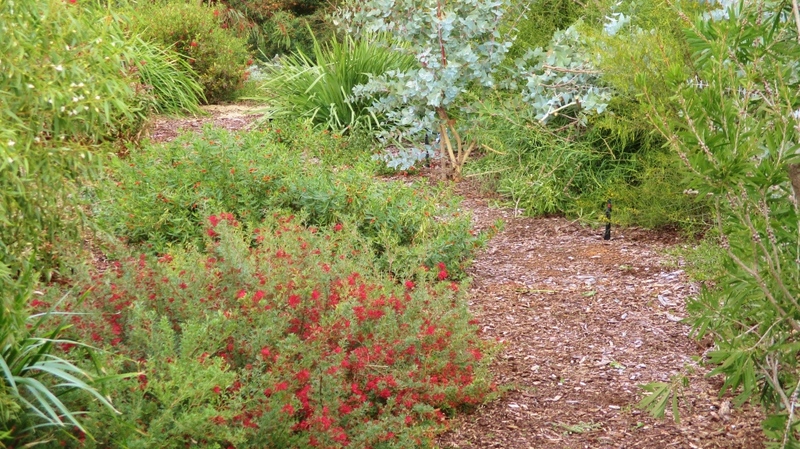 Contrasting is a restful informal area where mulch paths wind through plantings of Australian natives and other Mediterranean species. A pergola surrounded with white roses and covered with wisteria attractively shades an intimate eating area. An imitation windmill is one of several quirky objects dotted throughout, and hidden among the foliage waiting to be found is a litter of 10 ceramic piglets! There is a productive garden, some fruit trees and rainwater tanks; recycled water is also used. A young garden that shows what can be achieved in a short time. Extra activities: Home made Devonshire Tea; music by Katherine Trevilyan and Kassie Darnenburg; plant and produce sales; 'Find the Porcelain Pig' competition for children at 2pm. The chosen charity for this garden is Rotary and its "End Polio Now" program.